Palagan high performance transit packaging is critical to keep food fresh and safe. We manufacture BRC approved AA polythene food grade bags and films for processors across Britain. We are proud to be an approved food packaging supplier to manufacturers in the Marks and Spencer supply chain. We are experts in the design and production of transit packaging to protect and transport food and drinks. Our customised food grade polythene packaging meets the stringent hygiene demands expected by British food processing companies. And our polythene packaging meets all current food migration levels. From a small box liner to the largest of dolav liners, we make a huge range of bespoke products for food processing. The introduction of Palagan's food grade polythene bags and films are often critical to reducing potential contaminants. Plastic pallets, cores and interleaving slats are common requirements to meet the hygiene demands of many food processing companies. We work closely with customers like you to design food grade polythene packaging that aims to eliminate wood, tape and corrugated from the packaging you currently use. Our food grade polythene liners and box liners are easy-open for highly efficient operation in your factory. These polythene liners can be applied to fully automated production lines or smaller operations. To avoid wastage caused by food entrapment in the packaging creases, we can supply liners with block bottom or mitre seals. The block bottom feature creates a perfect fit inside the dolav or tray, resulting in less material being required. Mitre seals reduce product entrapment when emptying contents. Contact us to find out more about this exclusive product. Strong dolav liners are generally used to protect food during processing or transit. 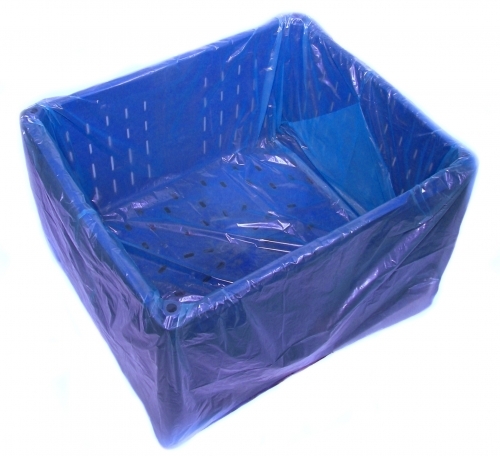 Generally supplied on a roll, these polythene dolav liners are designed to fit your specific dolav dimensions. To ensure your packaging costs are minimised, we recommend using our strongest, thinnest films. This promises maximum protection and great value. Palagan designs and produces perfectly fitting BRC approved polythene pallet covers and pallet bags for British food processors. As leading UK manufacturers of shrink pallet covers and non-shrink pallet covers, our polythene packaging protects food and drinks from any contaminants during storage and transit. To find out more about our extensive range of pallet covers, see here. At Palagan, we specialise in food grade automated films for high speed packaging. Our extrusion and conversion machines manufacture high strength polythene film used to contain any specific food weight. Every automated film is customised using our unique film blends to ensure smooth, efficient processing on your production machinery. Learn more about our automated films. Polythene sacks are an ideal packaging solution for a wide range of food ingredients. These food ingredient sacks can feature our exclusive block bottom design, with mitre corners to eliminate product loss. We have a special high clarity polythene blend especially designed for strength with pierce resistance, suitable for the frozen food industry. An added benefit, this material will maintain its plasticity when frozen. All food grade polythene is manufactured in the UK to your specification.